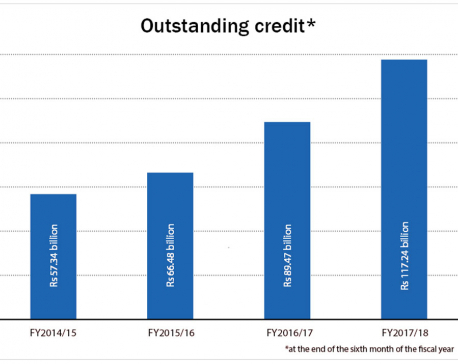 KATHMANDU, Feb 15: Credit flow of bank and financial institutions (BFIs) to non-productive sectors accounted for 41.6 percent of their total outstanding loans in the first six months of FY 2017/18. According to the Nepal Rastra Bank (NRB), BFIs have outstanding credit of a total of Rs 918.4 billion in overdraft, real estate, hire purchase and margin-type loan as of first six months of the current fiscal year. While the BFIs are struggling to meet the priority sector lending requirements prescribed by the Nepal Rastra Bank (NRB), a big size of their total loan portfolio has gone into non-productive sectors. Concerned with the over-exposure of BFIs to the unproductive sector, the NRB has taken initiative to lower their share in such sectors. Through its mid-term review of monetary policy held last week, the NRB introduced a new provision that requires banks to contain their overdraft financing to 15 percent of their total loans. Overdraft loans of BFIs accounted for 17.8 percent, or Rs 359.3 billion, of their total loans as of mid-January. Similarly, loan flow of BFIs toward real estate (including housing and home loans) sector in the review period stood at 14.8 percent of their total loans or Rs 321.6 billion. Similarly, BFIs lent Rs 149.3 billion, or 7.2 percent of their total loans, to hire purchase sector which largely comprises of automobile financing. Banks have made loan investment of Rs 43.2 billion, or 2 percent of total loans, in margin nature loans. NRB officials say that 'aggressive lending' of BFIs toward non-productive sectors has caused shortage of lendable fund in the banking industry. Commercial banks, however, have been reluctant to increase their lending in priority sectors including productive areas prescribed by the central bank. The central bank data shows that commercial banks have extended only 22.6 percent of their total credit in the priority sectors compared to mandatory requirement of 25 percent. Commercial banks in aggregate have floated 6.8 percent loans to agriculture sector, 3.2 percent to energy sector, 3.4 percent to tourism and 9.2 percent to other priority sectors, according to the NRB. Central bank requires BFIs to extend 10 percent of their total loans to agriculture sector, 5 percent to energy sector, 5 percent to tourism and 5 percent to other sectors. Amid complaints from banks that it is difficult to meet the priority sector lending requirement by the fiscal year-end, the central bank has announced that banks which cannot meet the lending requirement can book shortfall loans from other banks which have exceeded the limit.